With three decades of recording to his credit, multi-reedist and composer David Murray's oeuvre is a varied one; his dabbling in pan-global multi-ethnic fusions and ensembles has ranged from solo recitals to big bands. Murray's tenth album for Justin Time Records, Sacred Ground is inspired by his recent film soundtrack for Marco Williams' Banished, which documents the rarely discussed expulsion of thousands of African-American families from their homes at the close of the Civil War through to The Great Depression. 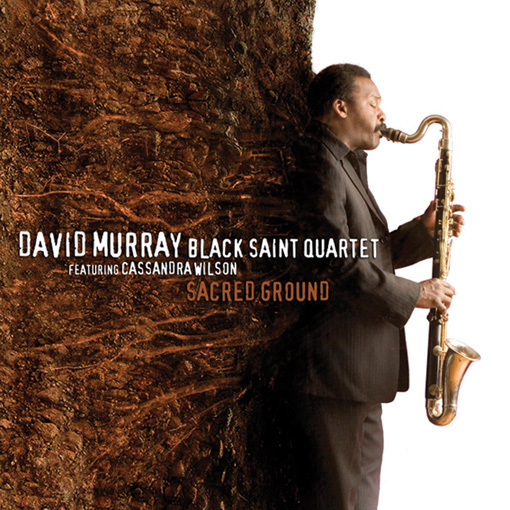 Sacred Ground is the first official recording of Murray's quartet without his long-standing pianist John Hicks, who passed away last year. Lafayette Gilchrist, a former student of Hicks, assumes his role with intensity and flair. Bassist Ray Drummond and drummer Andrew Cyrille have been two of Murray's main collaborators for years, bringing fresh perspectives to traditional concepts. Vocalist Cassandra Wilson joins Murray's stellar line-up on the dramatic ballads that open and close the album, with intrepid lyrics written by poet Ishmael Reed. An indictment against the oppression of former slaves after the Civil War, the titular opener features Wilson's soulful croon animating Reed's texts with simmering intensity. Rending at the supple fabric of the ballad structure, the quartet brings the piece to a simmering boil, climaxing with Murray's brawny tenor erupting in blistering, altissimo catharsis. Not all mordant introspection, the carefree West Indian lilt of "Transitions" provides respite, with Murray, Gilchrist and Cyrille delivering vibrant, pneumatic statements. The mournful "Pierce City" and "Banished" redirect the album through anguished lamentation. Filled with raw emotion, "Banished" unveils Murray's caterwauling bass clarinet over a roiling dirge, anchored by Drummond's sinewy arco bowing. "Believe In Love" and "Family Reunion" re-emerge from the depths with optimistic verve, the former a sultry tango work-out, the latter a riveting hard bop excursion. Bringing the album full-circle, Cassandra Wilson rejoins the quartet on "The Prophet of Doom," a slinky blues work-out that draws socio-political parallels to the exploited Cassandra of Greek mythology with wry attitude and erudite refrains, mirrored by Murray's effusive tenor. A focused and powerful statement from a multi-faceted artist, Sacred Ground is a perfect introduction for novices to Murray's voluminous discography.